How beautifully Burns uses the cuckoo to conjure up the image of spring in Scotland. You’ll also find plenty of references to ‘gowks’, the old word for ‘cuckoo’ or ‘fool’ in the poems of Burns and others. And while the breeding Cuckoo population is showing a long-term decline south of the border, in Scotland numbers have fluctuated but shown overall stability since the start of the Breeding Bird Survey in the mid 1990s. This difference is supported by the provisional results from Bird Atlas 2007-11, showing declines in the breeding abundance of cuckoos in the south and east of Britain but increases in much of Scotland. We hope that our five tagged birds will help us to understand why Scottish cuckoos have fared better than their southern counterparts by showing us whether the timing or patterns of their movements differ from those breeding further south. If their movements are similar, however, factors closer to home may be of greater importance. 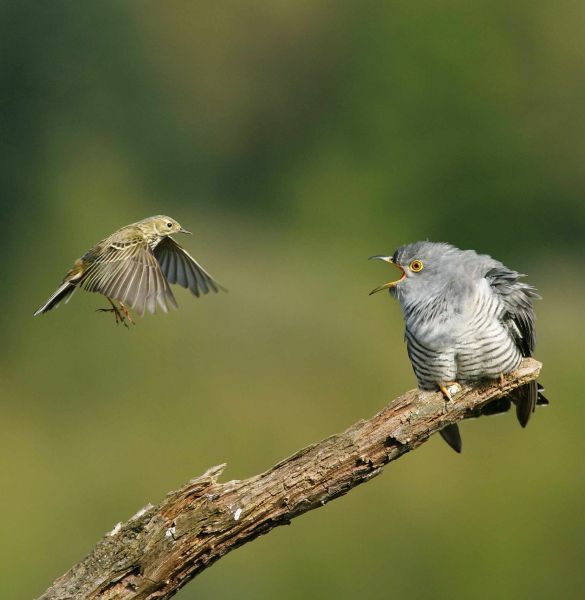 All five cuckoos were caught around the banks of Loch Katrine, within the Loch Lomond and Trossachs National Park and at the heart of the Great Trossachs Forest project, an area highly suitable for the species with good numbers of breeding birds. Cuckoo breeding numbers will be influenced by numbers of their host species (e.g. Meadow Pipits and Dunnocks in Scotland) and the large insect prey needed to rear their young. Projects across Scotland to encourage native woodland and scrub regeneration alongside open moorland (diverse habitat mosaics), and reduced pressures from sheep grazing in recent years, are likely to have benefitted Cuckoos and their hosts. Contact BTO Scotland for further information. Telephone: 01786 466560. Email: scot.info [at] bto.org.